Now you can build beautiful pages in opencart for products, catalog, information description or use a custom module to place it anywhere in your website. That's right, now you can design like a Pro. No programming knowledge required. You have the power to create landing pages from the admin panel or our frontend editor. As simple as drag-n-drop and edit the content. You can add a text or image block. Pick from a predefined template and edit it. Include a video or a gallery. Style it with our advanced styles and class. Its as simple as picking and option and saving the results. We have developed this extension to fit into any design. Many top themes already support it and most likely your does too. We promise that if you face any difficulties, our support team will set it up and have you designing in no time. You don't have to worry about making it mobile ready - we already done that. Just create and view in our frontend editor how it will rerender for mobile or iPad. We are developers ourselves. We love when the code is clean and extensible. That is why we added a way for you guys to extend VD by adding your own building blocks. If you see that something is missing - just make it. We are a high quality dedicated support team ready to help you out. We will help you set it up and get on designing. Just send us a ticket. 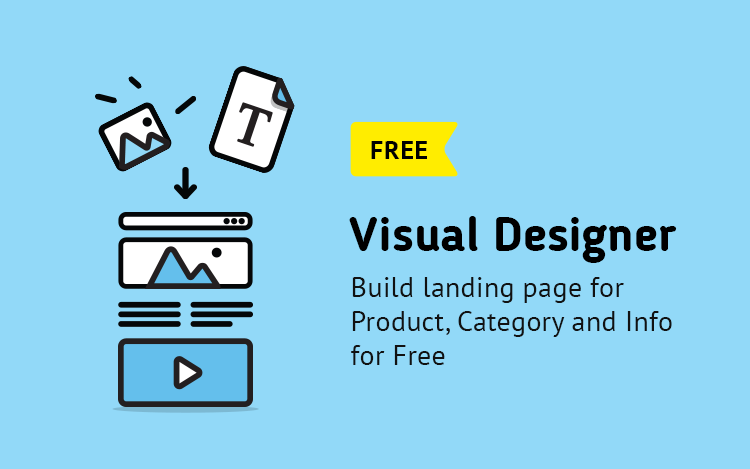 You can start create awesome landing pages right away absolutely free. If you always wanted to build your own product description with Text & Image - now you can. Added d_shoprtcode_reader_writer library. Reworked view for products, categories and informational pages. Added support OC 3.0.3.1. Fix bug with create child blocks. Fix bug with checkbox. 4.Added animate for control button. 6.Added the ability to disable the Visual Designer separately on the pages of goods, categories, information. 7.Added the ability to restrict access to Visual Designer for selected users or groups of users. 1. Added permission on frontend editor. 2.Redesigned popup window for editing layout. 3.Redesigned popup window for template selection. 4. Divided adding and saving a template. This awesome extension adds limitless possibilities for editing your description text areas. It creates a visual editor that will blow your mind. You will love how easy it is to create landing pages.